Need a quick & easy gift? 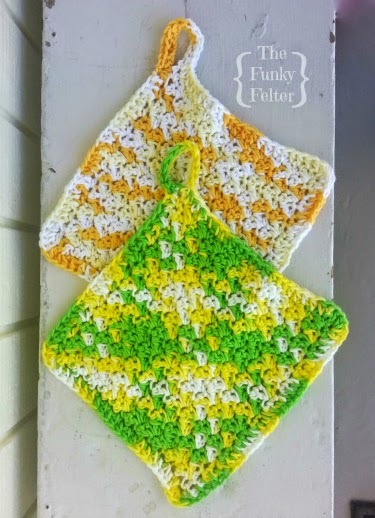 These crocheted dishcloths are perfect! If you are in need of a holiday, housewarming or birthday gift, these crocheted dishcloths are seriously perfect. They are quick and easy to whip up several at once. Then stack them and tie with a pretty bow - that's it! You're done! These are a favorite of my mom. She's quite a practical woman too and loves how well they wear over time as she uses them in the kitchen and washes them. The crocheted dishcloths are not just for looks. They really last and work well for cleaning up messes, spills and even pots and pans in your kitchen. 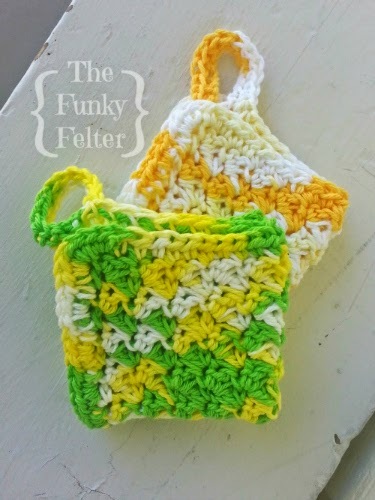 See below for the full free crochet pattern on these dishcloths. I prefer cotton yarn for these, but you could substitute a worsted weight yarn or your yarn scraps of similar weight. I personally like how the cotton wears and doesn't stretch out too badly over many uses and washing multiple times. My mom and I have had some of our cotton yarn dishcloths for years and years and years - and are still using them daily! Row 1: 1 sc and 1 dc in 2nd ch from hk, [sk next ch, 1 sc and 1 dc in next ch] repeat to end of row, ch 1 and turn. Row 2: [sk st, 1 sc and 1 dc in next st] repeat to end of row, ch 1 and turn. Row 3 and beyond: Repeat Row 2 until crocheted dishcloth length measures about 7-1/2 inches (or your prefered length). Finishing: Then sc in each ch st around the loop handle joining with a sl st at base. Tie off and weave in ends. Note: This is a version of the double crochet grit stitch. There are quite a few variations of this crochet stitch pattern online. Its textured surface works well for dishcloths, hand towels and other utilitarian items. Like my free crochet pattern? I have new crochet projects and other fiber craft tutorials coming up soon. Be sure to follow me or subscribe to my feed on the sidebar to get those posts. Don't miss out! For more FREE crochet patterns, check out my Crochet Cuteness board on Pinterest. And, please follow me for more great craft and pattern ideas!